Batch cooking is an important topic that more often then not is the deciding factor between success and failure. What happens when you get hungry? You want food and you want it NOW. If you didn’t already have a plan and food prepared… you will probably abandon all desires for health and stuff the nearest edible object into your mouth. Stale doughnuts in the coffee room, 2-year-old Halloween candies on the secretary’s desk, McDonalds, the freezer-burned corn dog in the freezer. We need a plan and we need to be prepared. Preparation can be the difference between sickness and health. Life is chaotic and messy and busy and stressful… so what do we do? <strong>Make healthy eating as easy as possible</strong>. Use canned, frozen, pre-washed, pre-chopped, microwave, etc. Yes we know that the ideal would be to grow your own organic produce. But most of us don’t live in that ideal world! We have errands, families, jobs, bills, etc. We have stress and cravings and other people in our lives that have their own stress and cravings. We are doomed to failure. Every billboard we pass has a skinny model with a cheeseburger. Restaurants on every corner, pictures in every magazine, how are you going to survive? Make it simple. Make it easy. When all else fails a can of beans with some salsa for dinner is far better then french fries or Dunkin Doughnuts. For this recipe use a crockpot so that you can turn it on and forget about it for a few hours. Mix up a quick salad with beans, seeds, and a tahini dressing and together you have a meal full of complex carbohydrates, protein, healthy fats, and a happy belly. My favorite way to cook spaghetti squash is to simply wash the outside and place into a large crockpot with about 5 inches of water, cover with lid, and cook for about 3 hours on high. The spaghetti squash is incredibly moist and tender. Slice open, scoop out seeds, and cover with bruschetta topping. Serve. If you don’t have a crockpot then preheat oven to 375 degrees F.
Cut spaghetti squash in half lengthwise from stem to tail and scrape out the seeds. Place squash, cut-side down, into a casserole dish with about 2 inches of water in the bottom. Place squash into the oven and roast until tender, about 35-45 minutes. Remove from oven and let rest until cool enough to handle. Using a fork, scrape the flesh to create long strands. While the squash is baking or cooking you can prepare the bruschetta topping. Wash tomatoes and dice, mince garlic, and combine together in a bowl with black pepper, liquid aminos (or salt), and balsamic vinegar. Feel free to add more salt, if needed. Wash basil leaves and shake off extra water. Take 3-5 leaves at a time, layer on top of each other, roll the leaves, and slice into ribbons. Repeat until you’ve ribboned all of the leaves. Combine the basil with the other bruschetta ingredients. 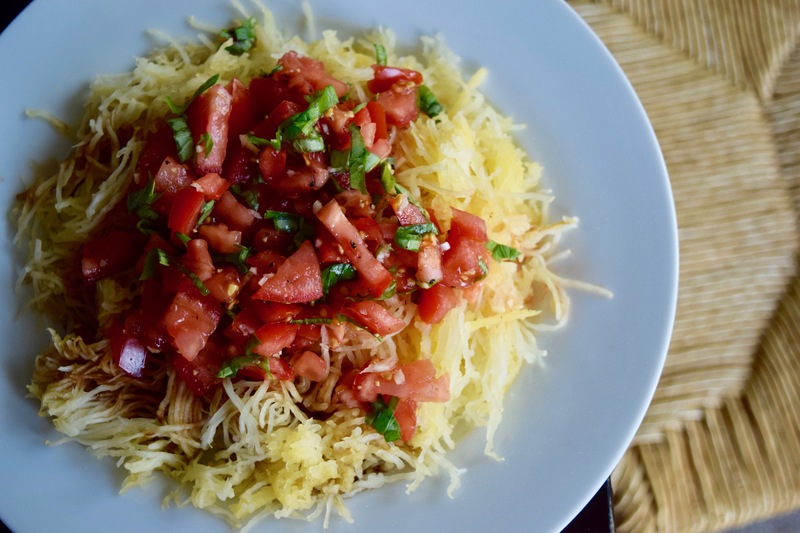 When ready to eat make sure the spaghetti squash is pipping hot, scoop into bowls or plates, top with bruschetta and black pepper and/or cashew parmesan, if desired. For a complete meal you could serve with a tossed salad that includes beans, seeds, and an oil-free tahini dressing (options above). Store remaining ingredients in the refrigerator for up to 1 week.